Tristar arms raptor ATAC shotgun accessories and replacement TriStar Raptor/Cobra Stock parts and pistol grip for sale. We have TriStar raptor 12 gauge Semi-Automatic Shotgun aftermarket adjustable stock, magazine extension, foregrip and tactical shotgun accessories. 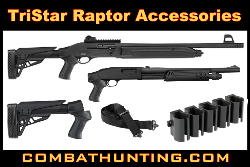 Your source for tristar raptor upgrades and TEC 12 Tactical Shotgun accessories.